The Russian PM has suggested that Obama’s charges against Russia were caused by a “brain aberration” and added that such rhetoric saddened him. “I am very upset by the fact that President Obama, while speaking from the United Nations’ podium and listing the threats and challenges humanity is currently facing, put Ebola in first place, the Russian Federation second and the Islamic State organization was only in the third place. 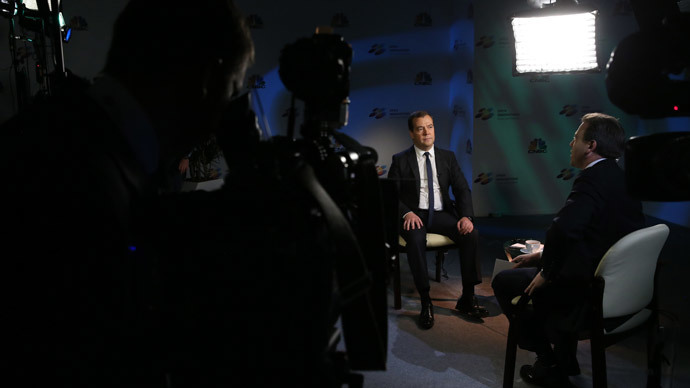 I don’t even want to comment on this, this is some sort of aberration in the brain,” Dmitry Medvedev said in an interview with CNBC television. The top Russian official stressed that his country was not isolating itself from the rest of the world, but sought mutually beneficial cooperation with foreign nations. “We want to communicate with all civilized peoples on friendly grounds. Of course, this includes our partners from the United States of America, but for this the situation must be leveled,” Medvedev said. However, the Russian PM also noted that the Western sanctions have inflicted considerable damage to Russia’s cooperation with the US, and without cancellation of this policy there can be no return to partnership. Medvedev ruled out the possibility of an immediate reset in relations between Russia and the West, adding that he expected the process to composed of at least two stages. “What sort of reset can be there under such conditions? We must first distance from this all and return to a normal position, at least to the starting position and only then we can start elaborating on the development of relations in the future,” he said. The Russian PM also stressed that Russia can and will find new partners for routine trade and normal investment projects.